Monitoring America's nuclear stockpiles is vital but mind-numbingly dull work. 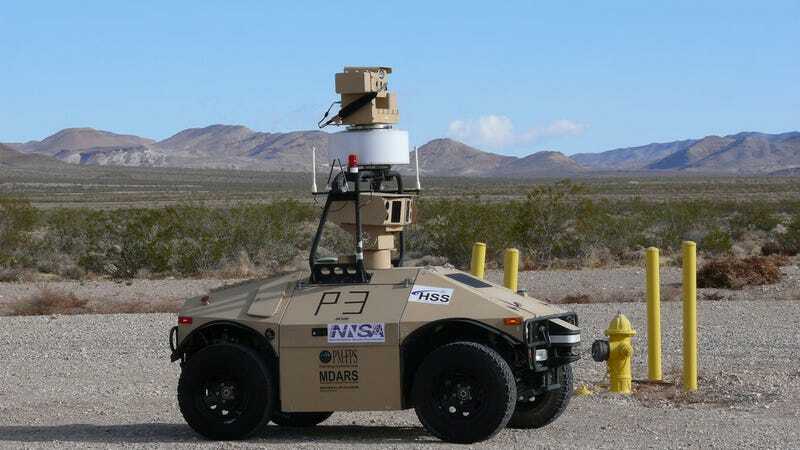 So rather than rely on easily distracted human guards, the storage facilities at the Nevada National Security Site (NNSS) are now being watched by the unblinking eyes of a mobile robotic patrol fleet. Originally developed in 2003 as a joint Army-Navy program to defend DoD warehouses, and in use at the Nevada site since 2010, the General Dynamics MDAR (Mobile Detection, Assessment and Response System) is a diesel-powered robotic golf cart packed with FLIR, RFID, and LADAR sensors, not to mention enough obstacle avoidance software to put Google's self-driving car to shame. What's more, these vehicles are smart enough to autonomously monitor for intruders—checking for signs of entry like ajar doors—as well as actively respond to and investigate alarms. Up to 16 MDARs can be controlled by from a central control center, can spot intruders from 200 meters, and only require human intervention when they actually find something. They're so smart that they randomly patrol the Nevada site so as to not fall into easily-avoided patterns and schedules.